Whenever I do a presentation on Google+ for publishers I mention that quite a few news and content brands are among the most followed pages. The point being that Google+ does indeed offer good opportunities for audience development, engagement and content promotion. Today I thought I’d check to see just how many news and content sites are among the top 500 pages on Google+. So I went through the most followed rankings on CircleCount to see how many fall into this category. For the purposes of this exercise I counted traditional news organizations, lifestyle publications, Web-only news and content sites and broadcast channels/programs with a companion site. 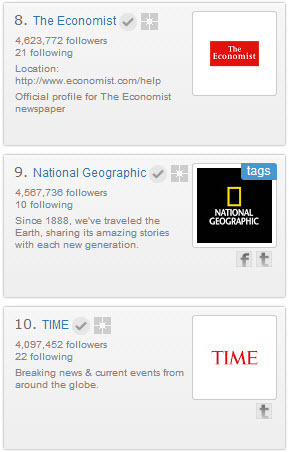 The three Google+ pages that made the top 10 are The Economist, National Geographic and TIME. 29% of the top 500 pages is a pretty good showing, and a wide range of content brands, areas of coverage and audience demographics are covered. This has been established for some time, but the Google+ user base goes well beyond young, tech-focused males. A number of international sites fared well too, particularly some from Brazil and other parts of Latin America. Here is the full list of Google+ pages, ranked by their CircleCount PagesRank (which is based on the number of followers). It should be noted that the figures reported by CircleCount will not exactly match what is shown on a Google+ page. However CircleCount informed me that the data for any page shouldn’t be more than 24 hours old. Follower count is not the most insightful metric (and it becomes quickly outdated) but I find it useful to take a snapshot at periodic intervals, as I do with my posts on Google+ engagement for news sites. I’m not surprised by your results – Google+ is certainly on something of a rise at the moment – many people had pretty much written it off in the face of Facebook (hmm) but it’s now got close to 360 million users a month against Facebook’s 1.15 billion. Twitter only has 200 million. The big news sites involvement only encourages other content driven sites to get involved. Yes, it’ll be interesting to see how it continues to grow and evolve, particularly for publishers.